Vroom, vroom, rev up that room! 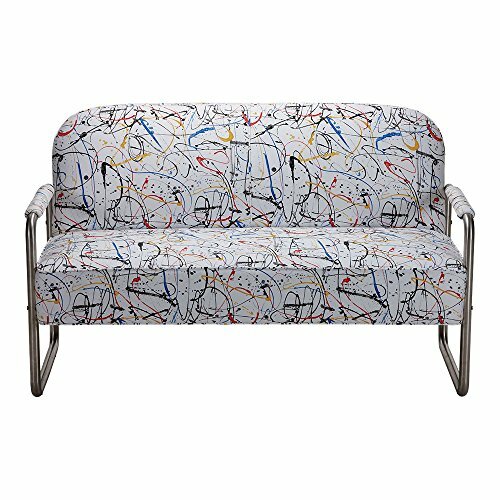 Vintage cars and mid-century style action painting pair up in this sleek bench-seat mini-sofa with tubular stainless steel arms. Sized perfectly to put at the end of a full-size bed or in any kids' room, TV room, or playroom, Orlando looks great coming and going. A stainless steel tube exposed frame creates a sleek, cool look, while a CertiPUR-US certified foam and fiber cushion provides a structured seat. Perfectly scaled to fit in a bedroom or playroom, but large enough for an adult. Hand-tailored armrests for ultimate comfort.